The Moving Circus returns to the home of the Brazilian Grand Prix as drivers and teams face Round 20 of the 2018 Championship before the season concludes in Abu Dhabi in a fortnight’s time. The race weekend at Interlagos is always a special event. The undulating and intimidating track, the rhapsodic weather and the adoring Brazilian fans are the ingredients for some highlights of the season. The track is usually referred to as Interlagos, however it was rechristened AUtodromo José Carlos Pace after the death of the Brazilian driver who scored his only Formula 1 win on this race course. The famous track is located in the suburb of Sao Paulo. Drivers usually love racing and driving on this relatively short, tight track, dipping and looping across a hillside, featuring many elevation changes and being reminiscent of a rollercoaster rather than a race circuit. 1. The Autodromo Jose Carlos Pace race track has a total length of 4.309km. Drivers will need to circulate 71 times to complete the race distance of 305.909km. 2. The current lap record is held by Max Verstappen. 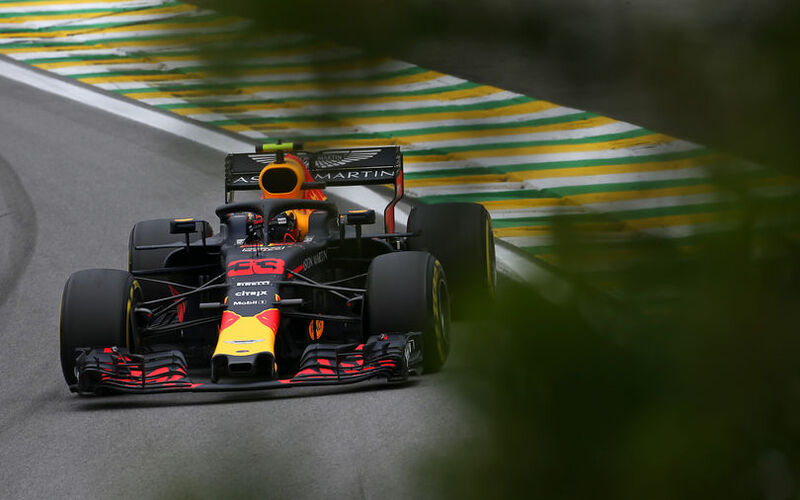 The Dutchman went fastest in last year’s Brazilian Grand Prix, clocking a 1:11.044 with his Red Bull. 3. As at a few previous venues, the start and finish line are not identical on the track. The difference between the two lines is exactly 30m. 4. The pit lane is 387.1-metre-long and features a very tricky, curved exit. Drivers have to adhere to a speed limit of 80kph during the race. 5. There will be two DRS zones today. The first zone has its detection point at the apex of Turn 2 and its activation point 30m after Turn 3. The second zone has a detection point 30m after Turn 13 and an activation 160m before Turn 15. 6. The track is made up of a mixture of medium-speed bends which puts a lot of lateral energy into the tyres. This, combined with the usually high ambient and track temperatures, usually leads to high wear, particularly at the rear of the car. Pirelli brought the combination of medium, soft and supersoft tyres to adapt to the track characteristics. 7. During yesterday’s qualifying session, Sebastian Vettel went fastest in the first sector with a time of 17.327, 0.053 seconds faster than his team-mate Kimi Räikkönen and 0.118 faster than Valtteri Bottas. Lewis Hamilton was the fastest in the middle sector. The Briton's time of 34.122 was 0.106 seconds faster than the time of Max Verstappen, second on this list. In the last segment of the track, Sebastian Vettel and Lewis Hamilton set an identical best time with a 15.601 which was 0.024 seconds faster then third-placed Valtteri Bottas. 8. A number of penalties were handed out during the race weekend. Force India had to replace Esteban Ocon’s gearbox before the third practice session for which the Frenchman received a 5-place grid penalty for today’s race. Daniel Ricciardo will also serve a 5-place grid penalty after Red Bull had to change his turbocharger for a fresh one, exceeding the Australian’s allocation. For failing to follow instructions during the FIA weighing procedure during the second segment of yesterday’s qualifying segment, Sebastian Vettel was given a reprimand and an EUR25000 fine. Sergey Sirotkin received his first reprimand of the season after the Russian drove unnecessarily slowly at 15:18 local time, during the first part of the qualifying session. Kevin Magnussen was given the same penalty for the very same offence as the Dane was also unable to reach the minimum delta time at 15:34, during the second part of the qualifying session. 9. Today’s Brazilian Grand Prix will be the 46th. The event has been held on two venues so far. 1973 marked the first appearance of the event on the Grand Prix calendar when Formula One first visited Interlagos. The event quickly made its reputation, mainly thanks for the adoring Brazilian fans. For 1978, the event moved to Rio de Jainero’s Jacarepagua circuit. Interlagos retook its place for the next two years, but Jacarepagua reconquered its slot on the calendar in 1981. The event moved back to Interlagos in 1990. 10. Alain Prost is the uncrowned king of the Brazilian Grand Prix. The four-time world champion won six times, on five occasions at Jacarepagua and on one occasion at Interlagos. Michael Schumacher has four Brazilian Grand Prix win, all scored at Interlagos, making the German the most successful drivers at the track located in the Sao Paulo suburn. Sebastian Vettel has three wins to his name which means he could equal Schumacher’s record if he wins today’s race. Kimi Räikkönen and Lewis Hamilton are the only other winners at Interlagos in the current field, both have won once. 11. Until today, five Brazilian drivers have won in front of their passionate and adoring fans, with Emerson Fittipaldi, Nelson Piquet, Ayrton Senna and Felipe Massa each winning twice and Jose Carlos Pace winning once. 12. For Nico Hülkenberg, the Interlagos track must be special. On 6 November, the German gained his first Formula One pole position, by 1.049 seconds over Sebastian Vettel at the Brazilian Grand Prix. This was the Williams team's first pole position since the 2005 European Grand Prix.